Mouse Creek Falls pours into the larger Big Creek, which is one of the clearest and most pristine waterways in the Park. 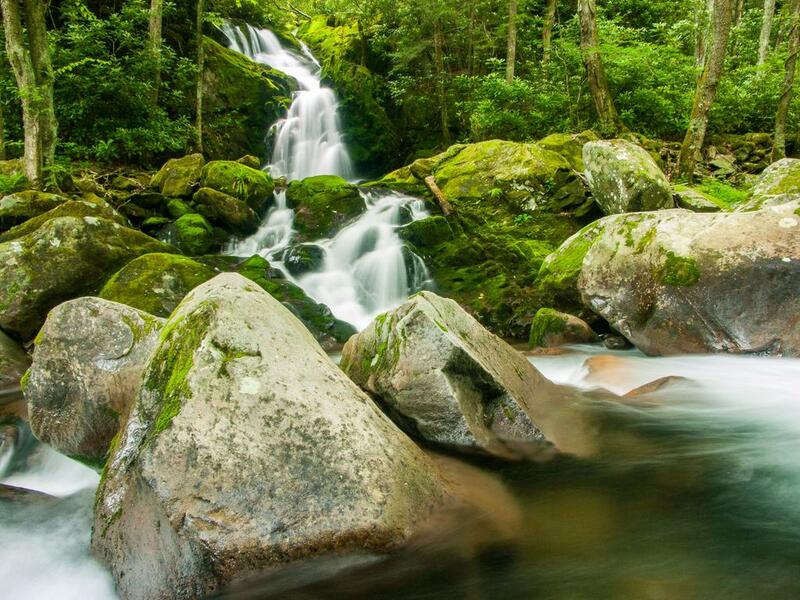 The combination of the two streams plus the huge, rounded boulders and lush greenery makes the scene a classic. From Asheville, take I-40 West to exit 451, Waterville Road, the first exit just over the Tennessee border, and turn left. From the Tennessee side, you'll be on I-40 East but take the same exit, and turn right. Cross the Pigeon River and take a left on the road following the river upstream. After about 1.3 miles, you'll reach the power station and cross a bridge. About 1/4 mile further on the road turns to gravel. A stop sign is about 2.3 miles from the exit - go straight. The road ends at about 3 1/4 miles from the exit at the Big Creek Campground, where there is a day hiking parking area, just after passing the trailhead on the right. Go back up the road you drove in on about a hundred feet and turn left onto the Big Creek trail. This is an old logging railroad bed meaning it's wide and never very steep as it follows Big Creek upstream. It's heavily used by horses, though, meaning it can be muddy and very rocky. It's about 2 miles to the falls, on the left, after passing by some other beautiful streamside scenes along the way.